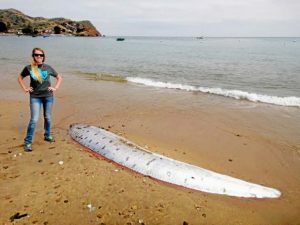 The Giant Oarfish is a species of enormous oarfish living in the depths of the ocean around the world and is seldom seen. Because of this shy nature, it was once thought to be a rare species. As and when they have been found, they were either injured or dead. Since their usual habitat is considerably deep, they have not been observed interacting with humans often, nor have many specimens been seen alive. Thus, scientists have little way of knowing about the species, or how threatened they really are. Also known as the ribbon fish, streamer fish, king of herrings, and Pacific oarfish, it is the largest living bony fish on the planet. Size: The standard length of the fish is about 3 m or 9.8 feet. Weight: Adult specimens can reach up to 270 kg (600 lb). Body: The shape of the slender body is ribbon-like, laterally narrow, and is without scales. Head: By appearance, it is small and somewhat rounded. Mouth: The jaws are protrusile (which is common to the other lampriforms), without any teeth, but having 40-58 gill rakers to catch tiny organisms as food. Fins: A long dorsal fin is present along its entire length, from between the eyes down to its tail tip. The pectoral fins are thick and stiff, whereas, the pelvic fins are long, with a single ray in each. The exact longevity of the giant oarfish could not yet be studied. The species is spread throughout the world in the open ocean’s mesopelagic layer falling under the pelagic zone, from the tropical to the temperate waters. 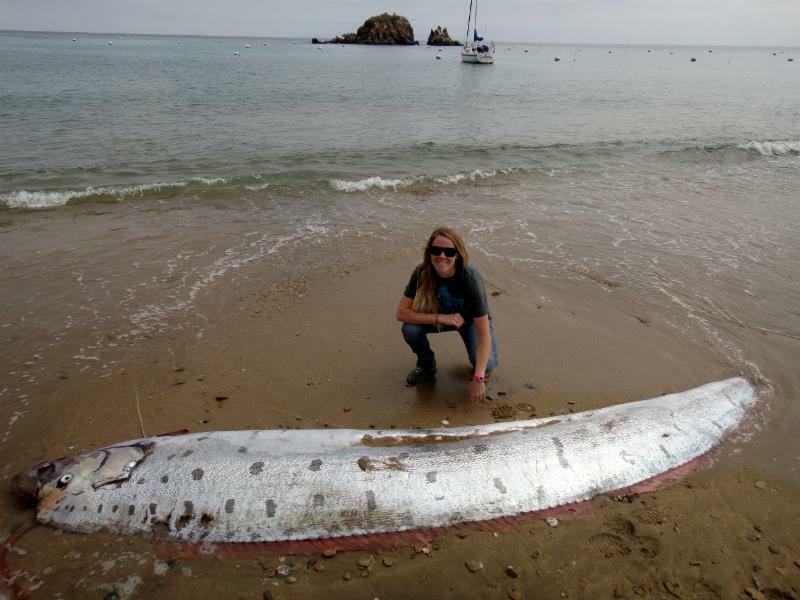 Currently, no regional subspecies of the giant oarfish have been described by the biologists. Because of their large size, many people mistake them to be dangerous, but it is the reverse. They are actually shy-natured, and because of their secretive nature, there is not sufficient data related to the general behavior of this creature. These fish roam around in the sea water in a vertical position using their dorsal fins in the mesopelagic layer, i.e., at a depth of 200 to 1000 meters. A specimen was filmed by a group of marine scientists in 2010 in the Gulf of Mexico. This was the very first footage of an oarfish that was shot in its natural habitat. The video clearly showed the fish swimming with its tail downward in a columnar orientation. This species is thought to live a solitary life. 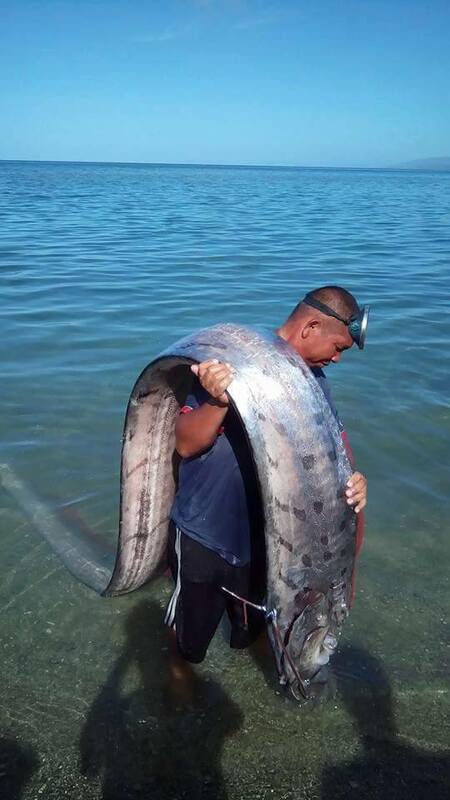 The giant oarfish has picky feeding habits. They primarily consume krill, zooplankton, and similar other small size crustaceans, as also, squids, shrimps, jellyfish and a variety of small fishes. 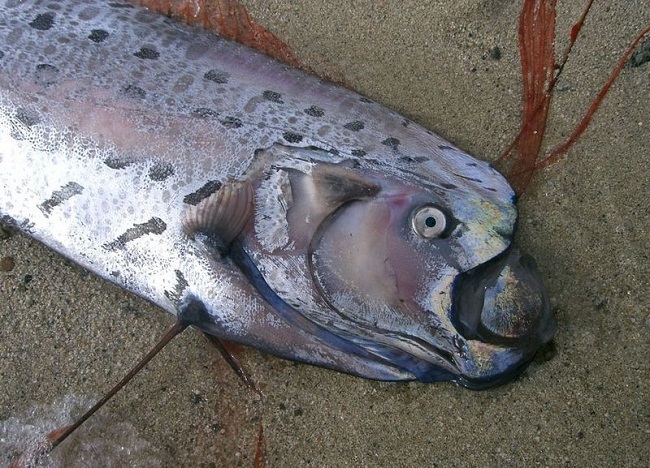 Little is known about the mating and reproductive behavior of the giant oarfish. It is generally believed that, like most other lampridiform fish species, they lay big pelagic eggs by means of broadcast spawning, which should be between 2 and 6 mm in diameter, and float near the water surface for up to 3 weeks, before they hatch. The fish is known to spawn between July and December. 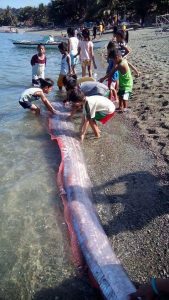 The larvae of this species have been seen close to the surface of the water and had been identified to be of the giant oarfish. As the baby giant oarfish hatch out, the embryos develop into larvae quite quickly. Juvenile specimens have been seen having distinctive long rays on the dorsal and the pelvic fins. As these fish grow up to an adult, they begin to live a secluded life. The ribbon like shape of the fish, itself, helps its long body glide through the water at ease without much resistance. The fin rays close to its large head are lengthened to form a distinctive bright red crest, which is thought to have evolved as a defense mechanism to scare off predators. Their long dorsal fins have the ability to propel rapidly and help them descend vertically under the water. The concentration of its internal organs toward the head-end of its body is thought to help it enable to survive even if it loses a considerable portion of its elongated tail. 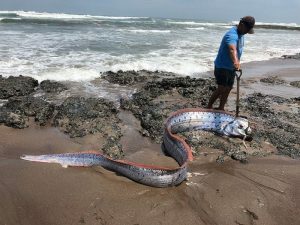 Their natural predators could not specifically be spotted; however, specimens, wounded by sharks and lancetfish, have been seen lying dead on the ocean shores. Previously thought to be a rare variety of fish, recent sightings of these fish at regular intervals across their range changed the notion of the sea scientists. The IUCN 3.1 has enlisted them under their ‘LC’ (Least Concern) category. The pectoral fins are stubby while the pelvic fins are long, single-rayed, and reminiscent of an oar in shape, widening at the tip. 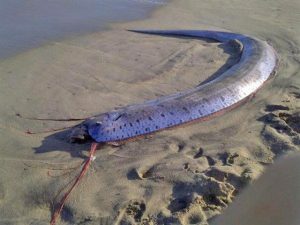 There are many folklore and legends associated with the giant oarfish, one of which is Japanese. The people of the island call them the “Messenger from the Sea God’s Palace”, and believe that, when many of these fish wash up, it is a prediction of a forthcoming earthquake. Their large size, combined with their undulating ways of swimming, has led to speculation that the giant oarfish might have been the source of many ‘sea serpent’ or ‘river monster’ sightings in the oceans and estuaries. People have tried eating these fish, but reportedly, they are ‘not tasty’, and “their flesh is flabby and gooey”. The recorded length of the longest giant oarfish is 11 m (36 feet).